The next generation is stepping up at Lettuce Entertain You Enterprises, or LEYE. 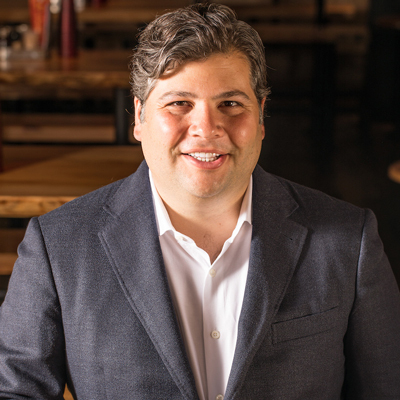 R.J. Melman, the son of founder and chairman Richard Melman, has been named president of the Chicago-based restaurant group, which owns, manages or licenses more than 120 restaurants, including 60 concepts in 13 states. The company generated sales of more than $580 million in fiscal 2016. The role of president was previously held by Kevin Brown, who remains the group's CEO, officials said. Richard Melman, 75, will also remain involved as founder and chair. R.J. Melman, 38, has been taking on more responsibility within the group in recent years, as well as serving as a restaurant consultant on projects outside the family-owned company. At LEYE, he has opened more than 13 restaurant and nightclub concepts, along with his siblings Jerrod and Molly Melman. Brown said he planned to work hand-in-hand with R.J. Melman to continue the group’s focus on the guest, finding and maintaining great talent and using technology to strengthen the company’s reputation. This year, for example, LEYE has launched several digital-only restaurant concepts, including ASAP Poke, Lucky Dumpling and Seaside’s. The group is also expanding its Beatrix brand, and this fall is launching Booth One, which will replace the Pump Room at the Ambassador Chicago, once a glamorous celebrity hangout on Chicago’s Gold Coast. R.J. Melman said in a statement that he’s looking forward to the next half a century for the restaurant company, which his father founded in 1971. CORRECTION: This story has been updated to correct R.J. Melman's age and the name of the Ambassador Chicago.